A crooked road to Arroyo Grande? Editor’s note: The Arroyo Grande ordinance limiting how the mayor and city council members may legally interact with city staff is at the bottom of this story. Business owners and city staffers in Arroyo Grande have come out with accusations of graft and corruption by Mayor Tony Ferrara and other city and county officials. The charges leveled against Ferrara and others include theft of public resources by public officials, threats and harm to political opponents using city resources, attempts to get kickbacks from contractors and misspending city money to support a favored developer. Ferrara also is the newly-elected president of the League of California Cities. He did not respond to detailed questions from CalCoastNews. As a member of the Arroyo Grande City Council, Ferrara is permitted by state and city laws to work with the council to set policy — and then may instruct only the city manager to carry out the council’s orders. Mayors and council members are prohibited by law from acting alone in giving orders to the city manager, or from instructing other city employees to do their bidding. But several developers, business owners and Arroyo Grande employees accuse Ferrara of ordering staff to do work for him using city equipment. California law makes the personal use of equipment and city staff for personal use a crime, theft of public services. On Sept. 27, Ferrara had three public works employees, two city trucks and one city backhoe at his home to remove a pear tree that had fallen over. The team cut up the tree and took the wood to the city corporate yard for disposal. A week earlier, Ferrara had another public works employee at his home moving a television set from his living room to his garage, employees said. Tony Ferrara’s fallen pear tree. Shortly after CalCoastNews began asking about the use of public services for his private home, the city issued a bill to Ferrara asking for $196 for the tree removal. The bill came on Oct. 6 and Ferrara paid the bill on Oct. 10. Three days later Ferrara told the city council that he had been charged a hefty fee for the removal of the tree. But a half dozen local tree specialists gave estimates all starting at a higher rate than the mayor paid the city. 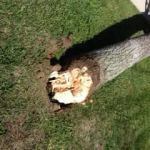 City Clerk Kelly Wetmore explained why the city had staff work on private property saying that because a portion of the tree was on the sidewalk, the city was responsible for its removal. However, Commander Kevin McBride, a 30-year veteran on the Arroyo Grande Police Department, said that in some cases city employees will remove a limb dangerously obstructing the sidewalk. But city staff does not chop up and remove entire trees for homeowners, he said. Last week, CalCoastNews contacted public works staff at five local cities. Each of the staff said that, in their city, removal of a tree was the homeowner’s responsibility. However, if a dangerous situation has been created and the homeowner is not able to remove a sidewalk obstruction, those cities will remove limbs covering the sidewalk, and require the homeowner to remove the remainder of the tree. In addition to allegations of theft of public services, business owners accuse city officials of using threats of withholding contracts in order to promote their political opponents and squelch critics. Several mayoral elections ago, one of Ferrara’s critics had SLOCO Data and Printing print and mail out pamphlets that painted a negative picture of Ferrara. Julie Tizzano, the owner of the Arroyo Grande business, said she was approached by Councilman Jim Dickens and told that if she did not mail out a correction, she would no longer do business with the city. She refused Dickens’ demand. Other business owners contend Ferrara works with the city manager, city attorney, and community development director in a convoluted, dysfunctional fashion that has cost those owners millions of dollars. Most said their biggest problem has been receiving specific directions from staff, complying with those directions, and then having city officials or other staffers change the direction delaying the project adding to costs for the developer. Many say they will not work in the city of Arroyo Grande as long as Adams and Ferrara are in charge. About 10 years ago, former Community Development Director Rob Strong promoted several changes to the city’s general plan to alter land use policies. Several months later, he entered into a short-term escrow on a property that included a large parcel of land and two older homes, known as the Cherry Creek property. Strong did not have the money to purchase the property, according to a disclosure that he made. Strong then contacted San Luis Obispo businessman Cliff Branch and recommended Branch develop the Cherry Creek property with a neighboring property owner, Branch told CalCoastNews in an email. The development required Branch to carry on a dialogue with Ferrara, Adams and City Attorney Tim Carmel, he wrote. During the period, Ferrara sought a meeting, Branch wrote. “At one point, Mayor Ferrara asked to ‘meet privately,’ and the two of us sat alone in the council chamber,” Branch wrote. “The mayor proceeded to give me a stern lecture on how to conduct myself during ‘his council meetings’ and strongly implied that it would be inadvisable to ignore his advice. Strong later asked Branch to provide him with a purchase agreement for a lot with one of the existing homes on the Cherry Creek property at a favorable rate. He told Branch that he supervised the Arroyo Grande staffer who would be the city planner on the project. City planners can either expedite permits and other requirements or delay and possible destroy projects. “It had always been a questionable situation because the city planning director had negotiated an option to purchase an existing house in the development, at a set price, which was highly unusual,” Branch said. The city took no action, Branch said. “The planning director warranted that he had made all proper disclosures to city officials. Ferrara had later said that it was ‘not an issue’ because a disclosure form was filed and approved by the city attorney,” Branch told CalCoastNews. About seven years ago, while the project was still in the approval process, Strong left the city and the developers began working with Adams and Teresa McClish, the city’s new planning director. 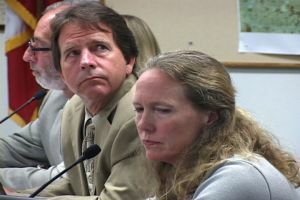 In the end, San Luis Obispo County Supervisor Caren Ray, a former Arroyo Grande city official who was involved in the projects approvals, purchased the home that Strong had optioned. By that time, the home had undergone extensive remodeling. Then, on March 4, 14 days before the closing of Ray’s home, the Arroyo Grande Planning Commission, which includes Ray’s live-in boyfriend Randy Russom, noted an administrative decision in the meeting minutes to designate the recently purchased home as historical. Because of the Mills Act, this decision will lower Ray’s property taxes by as much as 90 percent as compensation for limiting future remodeling and construction work on the home. Several years ago, Rick Loughead, another prolific developer and the owner of Dolphin Bay in Shell Beach, was working on a project in the village area of Arroyo Grande. However, because of issues with misdirection from city officials and staff which stalled project approvals, Loughhead said he sold the project at a loss and that he will no longer work with the city. In 2004, when John and Beatrice Spencer agreed to convert a vacant building in Arroyo Grande into a Spencer’s Fresh Market, they did so at a cost of several million dollars with assurance from the city that the Courtland Place parcel across the street would include courtyards and small size shops and not a large supermarket, John Spencer said. However, several years later, developer Nick Tompkins began negotiating a deal to place a large discount grocery across the street with the city manager’s support — prompting the Spencers to close their Arroyo Grande store. In 2011, Doug DeBerti approached city planners to get pre-approval for his plan to put a surf shop in the former home of J.J.’s Market. After receiving assurance from McClish that the project would sail through quickly, he purchased the building from Tompkins. 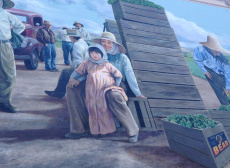 The mural the city denied and then approved. Then city officials asked DeBerti to share his parking lot with Tompkins and he declined. “After that things went south,” DeBerti said. Nine months later, city officials rejected DeBerti’s proposal because of issues they had with the driveway, as well as a mural he wanted to place on the side of the building. In the end, the building went back into Tompkins’ name. City officials then approved Tompkins’ request for the same mural and driveway that DeBerti had proposed. “If this isn’t corruption, I don’t know what is,” DeBerti said. In addition to complaints of the financial and emotional cost of attempting to deal with the city, residents question the cost to taxpayers for sweetheart deals to favored developers. In 2010, Arroyo Grande was dealing with a deficit. The city council was looking at cutting money from after-school programs and reducing the budget for police. The council then voted to buy the former Farm Credit building from Tompkins to use as City Hall. The $2,020,000 purchase price was almost twice the market value for the building. The council paid about $1 million too much to Tompkins, local appraisers said. The council and its members shall deal with the administrative service of the city only through the city manager, except for the purposes of inquiry, and neither the council, nor any member thereof, shall give orders to any officer or employee of the city under the supervision of the city manager. The city manager shall take his or her orders and instructions only from the council as a body, and no individual member of the council shall give any order or instruction to the city manager. Any subordinate officer or employee receiving orders or instructions contrary to the provisions of this section shall report the same in writing immediately thereafter to the city manager, and the city manager shall promptly forward a copy or summary of such report to each member of the council. He or she shall likewise promptly advise each member of the council of any order or instruction received by him or her contrary to the provisions of this section. It is not intended by the provisions of this section to restrict unduly the privileges of a member of the council to request the city manager, but not any other officer or employee under his or her supervision, to prepare a report dealing with any matter of city business, or municipal affairs generally, if such report can be compiled without the undue dislocation of city activities and without the expenditure of considerable quantities of time by city personnel. Don’t miss links to CalCoastNews investigations, like us on Facebook. 3. Tie a rope around it, hook it to your pickup and move the stupid thing until you can deal with it. did anybody notice that this article has been shared 900 times? If you assume that 100 eyeballs per share (a conservative estimate), that means over 90K people have seen this article. AMAZING for a town whose council is straight off the Appalachian mountains. Two things I recently noticed, What appear to be “new” Ferrrara for Mayor signs that don’t appear to be scaveged from his storage unit or garage from his first campaign. Guess his is worried enough to spend some oney on new signs. The house next to his in Berry Garden has one of the new signs, and it is for sale. Maybe someone should tell the realtor maybe the sign is the reason the house has not sold and that they have had to adjust the price, take the house off the market and then relist it. It has been on the market a much longer time than most, especially in Berry Gardens. I guess being the mayor’s neighbor isn’t a selling point. Maybe being the ex-mayor’s neighbor will help. I’ve noticed the new signs which certainly aren’t cheap, especially for a rush order, but no disclosure report was filled with the city by the Thursday deadline so it is unknown who paid for them. The mayor’s initial filing indicated he would spend less than $1000 so maybe they cost less than that and he paid for them himself? Maybe he got the same deal as he did for the tree removal! And IT services! Can you imagine what a frickin’ pain-in the-@ss neighbor Ferrara would be? He is completely oblivious to the boundaries of others, especially when it comes to something he wants, and that makes me wonder about the possibility of a narcissistic disorder. I imagine it will be awhile before Ferrara’s neighbor’s house sells, especially if the potential buyer lives locally or knows someone who lives locally. That is, Amen to the two comments below mine. Talked with Jim Hill last night when we ran into he and his wife at dinner. He has sent articles to the other newspapers, and NOT ONE has printed anything, but Cal Coast News. You are correct mb owner, the Trib and others have absolutely zero intention of giving anyone other than their chosen few a means in which to get their message out. When I hear folks say, “what does Jim stand for?”, I tell them they won’t get much news from the Trib, search Cal Coast. Is it any wonder this website is gaining in readership while the media supported by our dishonest officials continues to decline? People want to know, the Trib does a great disservice to this community by not making information available to them. More information at http://www.WriteInJimHillMayor.com and http://www.Facebook.com/WriteInJimHillMayor. Are they refusing to print pro-Hill letters-to-the-editor, as well? Yes they are. I have sent in several pieces, but nothing as been printed. I think we should have a fund raiser for CalCoast News—everyone who has posted on this site, if they contributed even 10 dollars, we could raise some serious cash for the news paper that reports the truth instead of lies and dribble. We need to take back our communities people and that include the press. I am not supporting the Fibune, I have cancelled my subscription and I urge you all to do the same. The Fibune needs to understand that they have sadly lapsed in their duties when it comes to reporting the truth—and we can hold them accountable as well. hijinks, you should know by now that the tribune rarely if ever takes a look at those that they choose to endorse for office. there are all sorts of “issues” and funny business that would be front page tribune news if it were a political figure they didn’t endorse, but for those they endorse, the tribune simply looks away or doesn’t even look. there are a number of issues that should be investigated in morro bay under the regime of irons, christine johnson and smuckler, but since the tribune has endorsed those, nothing will come to light. The last thing we need to do is give these cities and districts more New Sales Taxes, Double Taxation Road Funds, More Charter Powers and Excessive New Buildings ! Just take a look at your own paycheck or social security, what you pay for food and shelter, the basics, and those Automatic Rate Increases ! This is awful. But it’s child’s play compared to the corruption in San Luis Obispo. Why don’t you look into that? The giveaways to favored developer cronies, the corruption of “planning” so it means designing a general plan that includes every detail developers are asking for to do projects not permitted by the existing general plan, the thrown away public funds — it’s a big story nobody knows much about because the Fibune will never report it, and New Lies is clueless as to what “news” is. If that is the top issue for you, why don’t you write an op-ed and publish on CNN’s website? There is only so many issues a smaller, independent news source can cover. So I found it interesting KRISTEN BARNEICH was out and about putting up Ferraro signs today. She is so completely enamored with the man, she will do his dirty work too. It must be below Tony to put out his own signs. But then again I remember him saying he was not going to do any campaigning this time, he thought he had it in the bag. Watch city workers they may be putting out Tony signs also, god knows they don’t want to lose their jobs, and so they must do what the master says. I found it so nice that Ferrero put the little stagecoach on his signs just like Caren Ray had on her mailer, what a cute couple they made. i would love to see tony ferrara take a lie detector test simultaneous with Kristen Barneich taking an IQ test. Those would be some interesting, yet unsurprising results. She is such a disgusting, simmering little Ferrara toadie she is. Yikes guys! I don’t know her from Adam, so be specific. If you know something put it out there.